Opplev Ljubljana natteliv med en pubkryp gjennom Slovenias hovedstad. Denne turen er perfekt for enslige reisende eller grupper som er interessert i å møte andre reisende. Du vil tilbringe tid å bli kjent med de andre medlemmene av turen på den første puben, og deretter ta deg gjennom byen som slutter natten i en av de heteste danseklubber i Ljubljana. Partilederen din vil sponsorere utfordringer og spill underveis for å sikre at alle har en fantastisk tid. No matter what type of drinker you are, you will be having fun with all sorts of tourists! Literally did this the night we landed, the first bar was easy to get too where you start the pub crawl. The initial bar was like a meet and greet, and immediately after the drinks start coming! This pub crawl is not all about the drinks, our pub crawl expert Peter, helped us with getting to know the group, playing games like beer pong/flip clip, we even did limbo, and you were not forced to do anything you didn't want to! What was cool, was you got free drinks, as well as earned more drinks if you participated in activities. This activity is great for both singles and couples, I did it with my significant other, and we had a blast, the event started at 10 PM and ended around 3 AM, but you could leave at any point if you wanted to! IT was a blast meeting other tourists who were also in the city, and Peter did a great job of showing us all the hip bars. This is not just night club dancing, but seeing a little bit of all types of bars, from pubs to nightclubs. So dress accordingly, i simply had on jeans and a polo and was able to get in all clubs/bars fine! Slovenians dress smartly, so i wanted to fit in just in case i came across a dress code or something, but i didn't see anything. This tour is beyond cool to get a feel for the culture and enjoy slovenia! 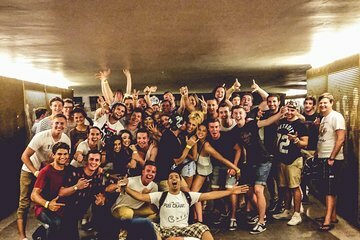 It is not only about the drinking but enjoying the experience with fellow tourists, who are also there to have fun just like you! Had a terrible cold so unfortunately missed this pub crawl. Looked like a lot of fun though. Prepare for a high energy adventure! George was loud and energetic throughout the night - the team make you feel welcome and take good care of you. Be prepared for large groups on Fridays and headaches in Saturday! Luka is a great host. This was a great way to get introduced to the city's Pubs and to meet other tourists. The Slovenia's appear to be great hosts and really cater to tourists, which is refreshing, since some other European cities tend to be almost offended by tourists sometimes. This was a great way to start the weekend.